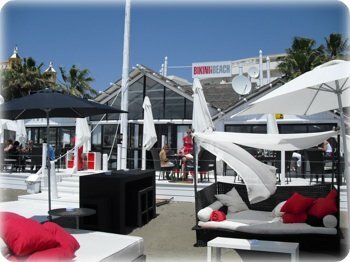 Best place for outdoor furniture in Marbella like on bikini beach ?????????? TerazzaBella.es in Estepona supply a wide range of garden and terrace furniture - they are super friendly and professional to deal with. If you want that to add that extra level of luxury I suggest asking them to make some bespoke cushions for you, they have a wide range of specialist outdoor fabric - even some with glow in the dark patterns! Go and visit them, you won't be disappointed! If you like the sunbeds on Bikini Beach you can find similar ones at Fernando Moreno, but they´re quite expensive. I´ve seen them before and they are absolutely gorgeous. They´re made out of the same material used on the seats of boats, which is similar to leather, but they are water and sun resistant so you can leave them outdoors all year long, rain or shine. Fernando Moreno is located in San Pedro right in front of the Poligono Industrial next to the BP station which is on the Ronda road. You can also find cheaper sun beds at Spot On which is located in the Poligono Industrial of Nueva Andalucia called Nueva Campana near La Campana. They are Nave 86. You can see their website here www.spoton.es to get an idea of what their collection is like. Tell them Zora sent you from Marbella Family Fun (and kickboxing) and they may give you a discount. If you´re really looking for a bargain then you may want to stop in to the Big Blue Box from time to time to see if they come up with any sunbeds. This is an auction house/commission shop in Estepona (close to San Pedro) that offer great discounts on second hand furniture. Their address is Centro Commercial Atenea Cn. 340, km 168. If you drive from San Pedro towards Estepona take the first exit after the Benahavis exit. Their number is 952 886 067.